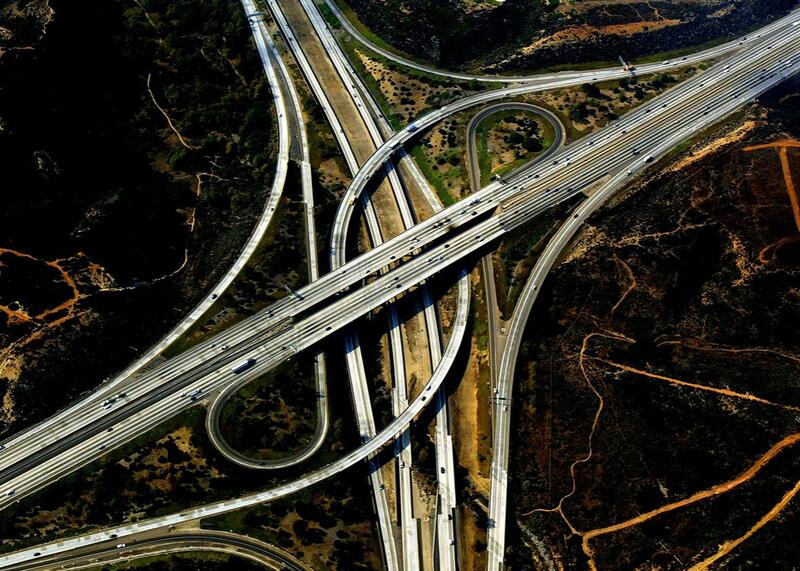 Interstate Highway System: How to fix a broken, expensive, harmful system. Hint: Not with more asphalt. The Interstate Highway System has helped drain the life out of our big cities, and we need to figure out a better, smarter, more sustainable way to connect Americans from one end of the country to the other. I hate the Interstate Highway System. I realize that this is an awkward time to bring this up. Many of you are no doubt planning road trips, and I’m sure you’re grateful for the fact that you do not have to traverse dirt roads in your Conestoga wagon en route to the Grand Canyon. Though I don’t know how to drive myself, I can absolutely see the appeal of barreling down the highway at top speed, singing along to Top 40 radio between bites of my delicious egg and cheese biscuit taco. I don’t begrudge you your love of the interstate, nor would I dream of dynamiting it into oblivion. Now that we have these wildly expensive marvels of modern engineering, we shouldn’t allow them to crumble, to the point where only Imperator Furiosa and Mad Max would have the guts to drive them. But we have to do something about the interstate highways, because as things stand, crumbling highways are exactly what we’re going to get. In case you’ve missed the latest highway news, the Senate and the House have been battling it out over which idiotic short-term fix we ought to settle for in order to keep federal highway funding flowing for the next few months or the next few years. One group of lawmakers, led by Sens. James Inhofe, R-Oklahoma, and Barbara Boxer, D-California, has devised a grab bag of revenue-raisers, from selling off oil in the Strategic Petroleum Reserve to hiking various custom fees to funky maneuvers involving the Federal Reserve that I won’t even pretend to understand. This deal, backed by Senate Majority Leader Mitch McConnell, R-Kentucky, would have financed the highways for the next three years. Another group, led by Rep. Paul Ryan, R-Wisconsin, chairman of the House Ways and Means Committee, wants to link highway funding to a broader overhaul of corporate taxes, with an eye toward encouraging U.S. multinationals to bring profits back home from their foreign subsidiaries. For now, however, Republicans in both chambers appear to have coalesced around a short-term solution that will fund the highways for the next three months to buy time. What’s so awful about these stopgap proposals? For one thing, they don’t fully account for the fact that most of the Interstate Highway System needs to be rebuilt, as the highways were built to last about 50 years, and the system was first established in 1956. Even with the best maintenance money can buy, you can only extend the life of these old roads by so much. How much will it cost to rebuild these highways, and to expand them to accommodate increases in traffic? Robert W. Poole Jr., a transportation expert at the Reason Foundation, estimates that it will take roughly $1 trillion. Others have estimated that reconstruction and modernization could cost as much as $3 trillion. You will be shocked to learn that Congress has barely begun to think through what it will take to rebuild and upgrade our highways. But our real challenge is not squeezing out just enough money to keep our existing interstate highways in good working order. Nor is it figuring out how to find a trillion, or trillions, of dollars to pay for an upgrade. It is facing up to the fact that the Interstate Highway System has helped drain the life out of our big cities and figuring out a better, smarter, more sustainable way to connect Americans from one end of the country to the other. Though the Interstate Highway System was first established in 1956, it was inspired by a miserable journey that took place decades earlier. In 1919, the U.S. Army sent a truck convoy from Washington, D.C., down a long, winding, and occasionally treacherous path to San Francisco. The convoy took just over two months to reach its destination, and the general crappiness of the roads was a memory that one of the young officers along for the ride, Dwight Eisenhower, would never forget. Decades later, after Eisenhower had helped vanquish Nazi Germany in part by taking advantage of its autobahns, gleaming superhighways far more advanced than almost any of the roads then in use in the United States, he decided to make the construction of a vast national highway network his first priority as president. What you might not know, however, is that according to Helen Leavitt, author of the felicitously titled Superhighway-Superhoax (somehow I suspect Leavitt feels the same way about the interstate highways as I do), Ike didn’t realize that the interstate highways would slice through America’s biggest cities until it was too late. The result of building a centrally planned highway system that doesn’t just connect cities (an inter-metropolitan system) but that also runs through them (an intra-metropolitan system) has been a bona fide disaster, as Marlon Boarnet explained in an article published in Transport Policy in January of last year. Essentially, proponents of the Interstate Highway System decided that they needed to make its benefits tangible to urban lawmakers, so they included a number of urban highways in their plans. What they failed to reckon with is that a one-size-fits-all approach to highways that might make sense for routes connecting cities across vast distances would by definition have to ignore the particular local challenges found in each individual city. Before the interstate, local transport plans were local. That is, they were sensitive to the particularities of different cities and regions, and they were responsive to issues of particularly local concern, like limiting traffic congestion and integrating automobiles with other modes of transportation, including public transit. For political reasons, local transportation authorities had little choice but to accept that new highways had to minimize disruption in existing neighborhoods. Moreover, planners in this era had to be thoughtful about how this new infrastructure was going to be paid for. The interstate changed all of that. In the pre-interstate era, most of America’s superhighways were turnpikes, financed by tolls. Because these roads had to pay for themselves, there was a powerful incentive to avoid building more road than was strictly necessary. Early plans for a national highway system involved tolls as well. Yet lawmakers in the Deep South and sparsely populated Western states objected to the idea, fearing that their highways wouldn’t generate enough toll revenue to make them financially viable. Thus was born the idea of financing the entire Interstate Highway System through a federal tax on gasoline, which would redistribute resources from states that generate a lot of gasoline tax revenue to those that generate very little. This new federal tax would fund a Highway Trust Fund, and through it the federal government would meet 90 percent of the cost of new highway construction, including local highway construction. Since the Interstate Highway System was almost entirely funded by the federal government, local policymakers found it hard to resist going along with plans that tore neighborhoods apart. Who in their right mind would turn down “free” money? Who would turn it down if the neighborhoods that were being destroyed were full of people who didn’t have a ton of political power, as was frequently the case? While this approach seemed to work pretty well in the first few decades of the interstate, it has proven destructive in the long term. Over time, as the cost of maintaining the federal highways has crept upward, lawmakers have been reluctant to raise the gas tax to a level high enough to keep up with rising costs. And so every few years Congress has to scramble to find some clever way to prevent federal highways from falling into utter decrepitude. It turns out that redistributing gas tax revenue from states with lots of drivers to those with very few also means redistributing gas tax revenue from states that need more transportation infrastructure than they have to states that have more transportation infrastructure than they need. In the late 1950s and 1960s, most observers didn’t see new federally funded urban highways as a problem. Rather, they saw them as an exciting new tool to revitalize downtowns and to raze so-called slums, some of which were in fact living, breathing, tightknit neighborhoods. This optimistic take proved wildly off-base. Nathaniel Baum-Snow, an economist at Brown University, analyzed the effect of highway construction on U.S. cities from 1950 to 1990. By comparing cities that received many new highways over this period with those that did not, he estimates that one new highway passing through a central city reduced its population by roughly 18 percent. Where did these people wind up? In the suburbs, of course. Furthermore, Baum-Snow estimates that while the aggregate population of America’s major cities declined by 17 percent in the wake of the construction of the Interstate Highway System, this population would have grown by 8 percent had the interstate highways never been built. Being a sober and responsible scholar, Baum-Snow never rails against suburban sprawl. In other work, he’s offered reason to believe that sprawl has yielded some modest economic benefits. I take a different view. In a counterfactual interstate-free world, Americans would likely be living in denser, more compact communities, where they’d spend more time walking and less time driving. We’d still have suburbs, to be sure, but I’m guessing they’d feature more apartment buildings and fewer cul-de-sacs. Local infrastructure would have needed to be financed locally, and so cities that had mastered the art of building and maintaining infrastructure efficiently would enjoy a huge advantage over those that had not. Instead, our central cities have shrunk, our suburbs have sprawled, and we’ve grown dependent on a gargantuan federal highway system that has grown frighteningly expensive. In a perfect world, we could hop in a time machine and convince Ike that the Interstate Highway System was in fact a terrible idea. Let state governments keep building turnpikes. Let states and cities build their own local infrastructure, financed by local drivers and guided by local wisdom. If poor states wanted to build gleaming new superhighways, well, encourage them to issue bonds to pay for them, to be paid back through their own gas taxes. Assuming time travel is off the table, let’s learn from our mistakes. First, let’s get the federal government completely out of the business of maintaining the interstate highways crisscrossing our big metropolitan areas. Hand these roads over to state governments as soon as possible, and free state governments to finance these roads in any way they see fit, from higher state gas taxes to variable tolls they could use to reduce traffic congestion. Second, for interstate highways that connect cities across deserts and cornfields, let’s replace the federal gasoline tax with per-mile tolls. One of the many problems with the gas tax is that as gas mileage improves, and as a small but growing number of drivers turn to electric vehicles, gas tax revenue is not keeping up with the needs of the highway system. Per-mile tolls can solve that problem by charging drivers according to how much they actually use the highway system, regardless of the kind of vehicle they’re driving. And as Robert W. Poole Jr. explains, they can be pegged to the cost of each road and bridge, which will help ensure that roads and bridges are adequately financed. After adopting this approach, we will see states investing in the infrastructure projects that best meet their needs, with some states, like California and New York, choosing to invest more heavily in urban mass transit while others, like Texas and Utah, build bigger and better highways. What remains of the federal highway system, meanwhile, will evolve over time, as the routes that attract the most traffic will grow in line with their per-mile toll revenue while those that attract the least will stay the same size, or perhaps even shrink. We’ll have an infrastructure worthy of a bigger, denser, more decentralized America—the kind of infrastructure that Ike, in his infinite wisdom, would be proud of. *Update, July 29, 2015, at 1:17 p.m.: Due to a production error, an outdated version of this article was originally posted. The text has been updated to reflect changes that were made by the author before publication but after an initial edit.